The use of weathervanes dates back to ancient times when the first weathervane was used a temple in Athens. Since that time weathervanes have been produced and used in a variety of materials and portraying many different forms. One popular form is the sailboat weathervane which will discussed in further detail here. The sailboat weathervane normally consists of a wind vane which is an unbalanced arrow shaped piece which rotates about a centre shaft. As the wind blows it rotates and aligns itself to the direction the wind is blowing at that time. Another piece is a fixed four quadrant wind direction indicator. By aligning these indicators properly, the wind vane will point to a particular quadrant so that the direction can be determined. A very important part of most weathervane is the form which is added to the top. This gives the weathervane its distinctive look and has provided a great deal of customisation. For many years the common shape used on a weathervane was that of a rooster. This happened due to a decree from the Pope and for hundreds of years rooster shaped weathervanes were placed on top of churches throughout Europe. The practice extended to many other structures throughout Europe and eventually followed to America. In America many kinds of shapes were also developed for use as a topper for weathervanes. For a long time, political themes were important such as the eagle and Lady Liberty figure. During the 1800’s horses began to be used. Since the horse represents strength, agility, and nobility these were popular items of choice. Since the direction of the wind was a vitally important factor in sailing ships, this theme was carried over by adding a sailboat shape to weathervanes. For people who are interested in the sea and may be located in a nautical setting, this is a perfect addition to their primary or secondary homes. A sailboat weathervane can be obtained in a wide variety of sizes, colours, shapes, and materials. To find just the right one for you, do a search on this website to find many choices of these kind of products. You can review a great deal of helpful and detailed information including pictures and descriptions which shows the materials used, sizes and recommended installation. We have a qualified customer service department to help you every step along the way. In addition to sailboat weathervane selection, we can assist with shipping and installation. In this way you can be sure of installing a sailboat weathervane you love and which will greatly add to the overall look and beauty of your home or outdoor structure. 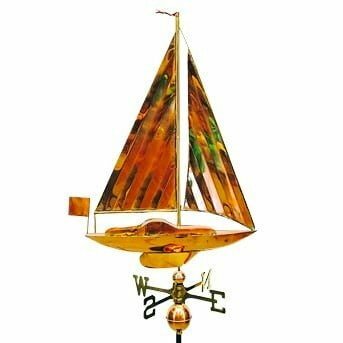 Whether you live near or far from the water, you’ll be glad you purchased a sailboat weathervane.